Many of you may be new to this whole working out thing, so as your trusted resource for everything fitness, we took the liberty of answering some questions we hear on a regular basis. Whether you’re a beginner or an advanced athlete, it never hurts to brush up on the basics. The answer to this beginner question depends on your goal. If you’re trying to lose weight, shorter rest periods will help keep your heart rate up, for greater cardiovascular benefits. Short rest periods are also the key to maximizing your pump. However, if you’re trying to build strength, short rest intervals will only hinder you. Heavier weights require recovery in between sets. Your workout is not a race, and the goal is to increase your strength. If you only rest for 60-90 seconds, chances are you won’t be able to give the next set all you’ve got. As a rule of thumb, rest for as long as it takes for you to be able to take on the next set effectively. For a longer answer to this question, read our blog dedicated to the topic. 2. Does it matter when I eat? Everyone is different. You may have great success with intermittent fasting, while another beginner may have to eat every two hours. So instead of focusing so much on when you’re eating, focus on how much you are eating. If you are just starting a workout program, you will need to adjust your daily macros. Depending on your goal, calculate how much protein, carbs and fat you need each day to reach it. Tracking your food in this way will give you a better idea of what you’re putting in your body, and help hold you accountable on a daily basis. For a more in-depth answer, read this blog. 3. Should I eat less on days that I am not lifting? Again, if a weight-training program is new to you, this beginner question probably seems perfectly reasonable. If you aren’t lifting, your body requires less calories, right? Wrong. Rest days are just as important to your muscle-building and weight loss goals as the days you work out, if not more so! Rest days allow your body to recover and rebuild. Without rest, you’ll never see any progress. And this is especially true if you deprive your body of the calories necessary to repair the muscle damage you caused in your training sessions. Stick to your macros like you would on a normal workout day and fuel your progress! 4. How long should I spend warming up? Warming up is both overrated and underrated. First of all, you don’t need to spend 30 minutes getting warm. Our guess is you don’t have an extra 30 minutes to begin with, and it’s simply not necessary. However, not warming up at all is highly discouraged, especially if you’re planning to lift heavy. To compromise, try to find time to work on your mobility outside of the gym. When you’re watching TV or getting ready for bed, do a few basic stretches to keep your muscles limber. Then, when you do get into the gym, you only need to spend about 15 minutes getting warmed up. Not sure how to warm up? Start with 5 minutes on an elliptical or other low-impact cardio machine. Don’t exhaust yourself, but be sure to get your heart pumping and your muscles warm. Next, grab a very low weight and do a few sets of an exercise that works the muscle you plan to focus on. For example, if you’re training biceps and triceps do 20 bicep curls and 20 overhead triceps extensions. Focus on feeling the movement and waking up the connection between your mind and the muscle. 5. What is mind-muscle connection? 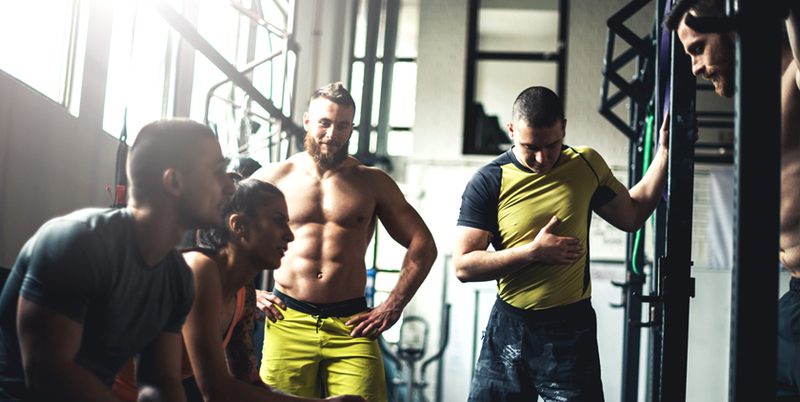 You’ll hear the term mind-muscle connection a lot in conversations about staying focused at the gym. It’s not always easy, but your brain plays just as much of a role in your workout as your muscles, so it is important. Obviously, everything your body does is controlled by your brain. When it comes to working out, this specifically applies to muscle contractions. A signal is sent from your brain telling a muscle to contract. At the same time, your brain releases a chemical neurotransmitter called acetylcholine. This chemical crosses the synapses between the nerves and the muscle to bind to receptors on the muscle fibers, which causes a contraction. During this communication, your mind and your muscles connect. The more you improve the communication, the more muscle fibers you will recruit. The more fibers you recruit, the better the quality of the contraction, and the more effective your workout becomes. Do you have a question? Send it to jamesqa@bpisports.net for your answer!